Before we get further, we’d like to point out that we’ve updated our Trade Calculator for the 2018 season. There might be a couple of data entry errors in names – if you spot one let us know below or on Twitter. Last year HPN unveiled PAPLEY – about as convoluted an acronym as you can get, but a pretty good tool nonetheless. PAPLEY stands for “PAv Player Linear Extrapolated Yield” – and since PAV is Player Approximate Value we’ve got a recursive acronym with “player” twice in the first four words. While in our work during last year’s trade period we stated that we would evaluate and potentially overhaul the method this year, in the end we did very little this year – we got a bit busy with Footballistics and other work in the meantime. We did a fair bit of evaluation however, and we feel that PAPLEY is, and I’ll quote here, “pretty good”. The biggest change we made was for the treatment of first year players aged 20 and under, who were being projected at extremes, and often away from other how historically similar samples turned out. To reduce this, HPN added a constant to better represent the most likely outcomes for these players. This means that a post first year Sam Powell-Pepper – who was rated as being worth significantly more than pick one – won’t happen again this year. The closest comparative example this year is Jaidyn Stephenson, who had a fine first year in the league. He’s still worth around pick 1 according to PAPLEY, and the most similarly valued past players to Stephenson at the same age of 19 performed to around his projected level (149.7) in their subsequent careers. 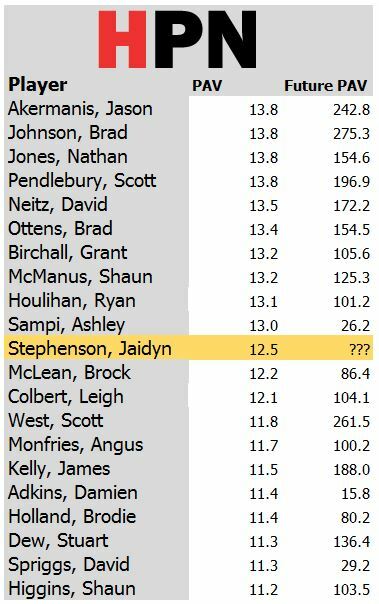 But, as you can see, the variance is pretty large from such a young starting point, and there’s a fair amount of difference from Pendelbury and Akermanis to Adkins and Spriggs. Generally, the more information we have about a player, i.e. the older they are, the more accurate PAPLEY will be with its prediction. Stephenson isn’t the most valuable future player according to the full career version of PAPLEY (we will get to that distinction later). The most valuable is, as the headline teases, Melbourne powerhouse Clayton Oliver. Young players still dominate the top end of this list, which makes sense given the accumulative method of valuing future worth. Generally, the younger a player is, the more footy they have left in their career. There is a balance built in, however, between demonstrated ability and length of career remaining. 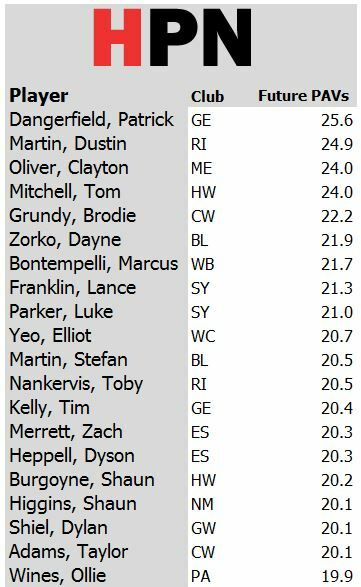 This risk factor is reflected by players with a longer high quality track record like Bontempelli sneaking in among younger guys like Alex Witherden. Oliver, who is a couple of years older than Stephenson and Rayner, blends the promise of extreme youth with a body of work at league level like few have before. 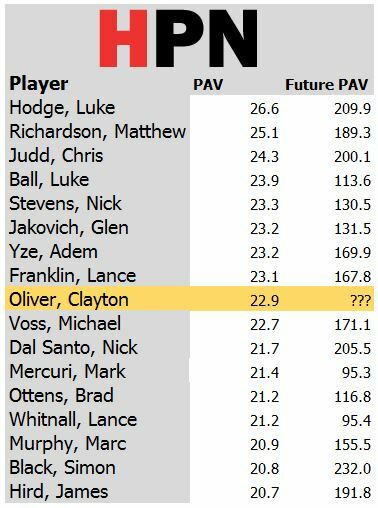 Only eight players have gotten a higher PAV (we’ve chosen the sample years of 1993-2008 to try to capture full careers) at the same age as Oliver. Those at this mark by Oliver’s age have generally gone on to fantastic careers. 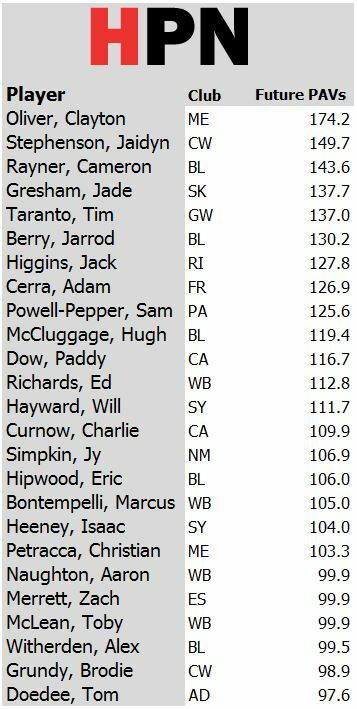 Mark Mercuri is a fantastic worst case scenario, and the likes of Black, Judd and Hodge should be exciting comparisons for Melbourne fans. In a heads up trade for Oliver, Melbourne would be looking at a bit more than pick 1 on its own – the only player in the league for whom we think this is definitively the case. 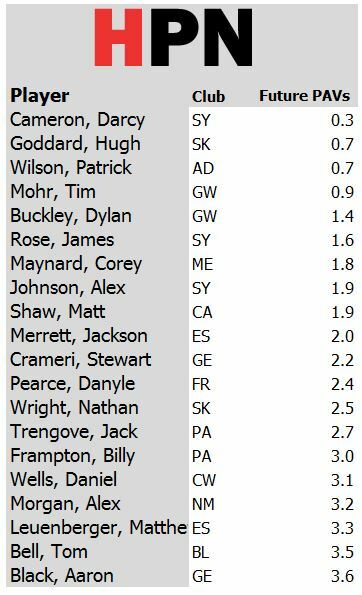 The familiar twosome of Martin and Dangerfield fill the top spots, closely followed by Oliver and Mitchell. Older types such as Franklin, Stefan Martin and Higgins litter this list, with merely going around again forming the major potential impediment to their future prediction. What if we take this to the next degree, and try to predict the next five years, if retirement, career ending injury and delisting are assumed not to be an issue? 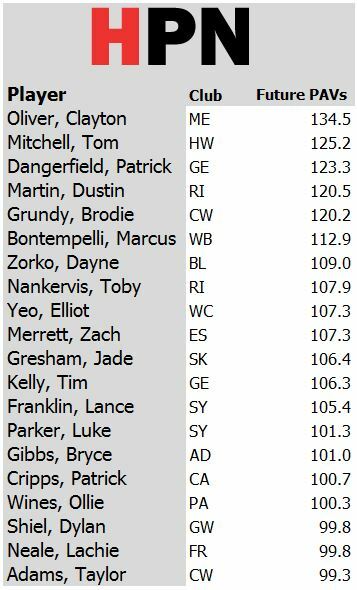 It’s a similar story to the one above, but Oliver’s and Mitchell’s predicted improvement over time give them an edge over Dangerfield. If Franklin is still going in five years time (we’re betting against this, for what it’s worth), his production should continue strongly for at least the next three years. Finally, let’s look at the least valuable careers from here, based on the information we have at hand. Most of these predictions are clouded by extremely small samples, injuries or both. Many of these players have already been moved on, with others remaining as depth players going forward. Darcy Cameron presents an interesting case study – he is already 23, but has played just a solitary AFL game – as close a blank slate as there is in the league. Over the coming days, HPN will look at the free agent class of 2018, and give a preview of the trade period to come.